An old school was purchased by Saint Thomas physicians and named "Protestant Hospital," opening its doors March 20, 1919. The facility was born from a doctor schism at Saint Thomas, which had been started by nuns 20 years before. "These physicians had a different view of how they thought medicine should be, and there was — at the time — a great need for more beds because of the Spanish flu," says Saint Thomas Health chief mission and ministry officer Greg Pope, who has become the unofficial historian. "So they literally just went out the back door, across the street, bought an old school campus and started Protestant Hospital." The competing facility was meant to be nondenominational and serve both those who could pay and those who could not. The first patient was reportedly a mother delivering a baby. The unaffiliated hospital was busy but struggled financially. 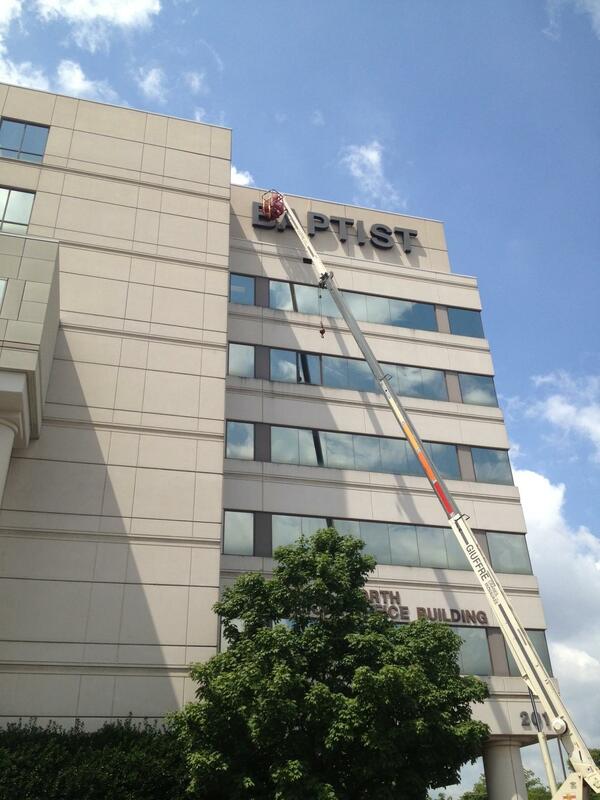 The Baptist signage came down in 2013, more than a decade after Saint Thomas acquired the midtown campus. After World War II, the Tennessee Baptist Convention rescued it from bankruptcy under leadership from Jack Massey, a pharmacist and businessman. He would go on to pioneer for-profit health care 20 years later by helping start Hospital Corporation of America nearby. Baptist grew to nearly 700 beds and delivered more babies than anywhere in town (still does). The facility broke from the Tennessee Baptist Convention in 1991, but in the early 2000s, it needed a buyer again. And Saint Thomas — which had moved to the western edge of town — brought the rival hospital back into the Catholic fold. "You could also say that whatever that fracture or tension was in 1919 got healed up," Pope says. "It was really a reunion." It took more than a decade for the parent company, Ascension, to rebrand Baptist as Saint Thomas Midtown. Even now, Pope says Baptist can be seen on old campus signage and more often heard as patients reference the hospital that opened March 20, 1919. The neonatal intensive care unit at Saint Thomas Midtown is the first in Middle Tennessee to go live with baby webcams, a technological upgrade that hospitals around the country have been installing. But the video streams are seen as more than a modern convenience. For the most fragile babies, there's one thing that's almost guaranteed to boost their chances of survival: breast milk. So a nonprofit in Nashville is trying to make it easier for infants to obtain it when their mothers can't produce enough. Their goal is to open a breast milk bank, similar to a blood bank, that would store and distribute donations from other moms. A major Nashville-area charity is fighting for its life in court. The Baptist Healing Trust Fund said Tuesday that more than $100 million of its $123 million in assets is at risk in a legal battle that pits the charity against a federal agency.